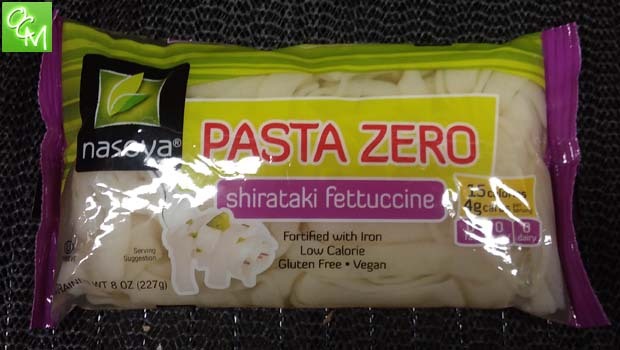 Pasta Zero Shirataki Fettuccine review, ingredients info for gluten free or low carb diet pasta – I saw the Pasta Zero Shirataki Fettuccine in the refrigerated section near the produce aisles, right next to the sprouts. My gluten free diet had me looking at the sprouts for a soup (to replace noodles) and when I saw the Pasta Zero, it intrigued me. It differs from the traditional gluten free options which are still usually high in carbs. Pasta Zero is made with water, konjac flour, chickpea flour, and potato starch… and only has 15 calories and 4g of carbs per serving compared to 220 calories and 43g of carbs for regular pasta. The Pasta Zero Shirataki Fettuccine looks odd…it’s in a bag that’s filled with liquid and the pasta is packaged in it. So, it’s fully “cooked” and just needs to be reheated. Some brands are perishable and need to be refrigerated until ready to use. Pasta Zero Shirataki Fettuccine pretty much has no flavor and takes on the flavor of the sauce and foods you pair it with. You will get a scent when you first open the package, but it’s gone once you rinse the pasta. I prepared the Pasta Zero Shirataki Fettuccine with a traditional red sauce. I really enjoyed the taste since the sauce (which I love) was the dominant flavor. This was a nice change from the gluten free pastas that I feel come in second place to the taste of the true gluten pastas. If I could, I would always opt for the gluten full pasta over gluten free pasta. But, that’s not an option for me, hence my search for a decent replacement. The texture is odd. I’m big on texture, and I just can’t get past this one. Rather than having a simple texture like both regular pasta and gluten free pasta have (except for the lentil gluten free kind – yuck! ), Pasta Zero Shirataki Fettuccine has a texture like shrimp. It’s more firm and definitely unexpected for pasta. I just can’t get used to it. For me, it’s a deal breaker. But, if you want to give it a shot, I’d suggest going with the regular spaghetti cut rather than the fettuccine where the texture is probably a bit more obvious.